Saturday, the final day of this whirlwind weeklong trip to East Asia, marked the start here in China of the Mid-Autumn Festival, a harvest festival – sometimes also called the Moon Festival or Harvest Moon Festival – held on the 15th day of the 8th month of the lunar calendar. The festival, which dates back to the Shang dynasty (c. 1600–1046 BCE), is when friends and family come together and give thanks for the harvest. (It’s believed that the moon is the brightest and fullest on this day, signaling a time for family reunion.) Those back home in Indiana might think of it as Thanksgiving. 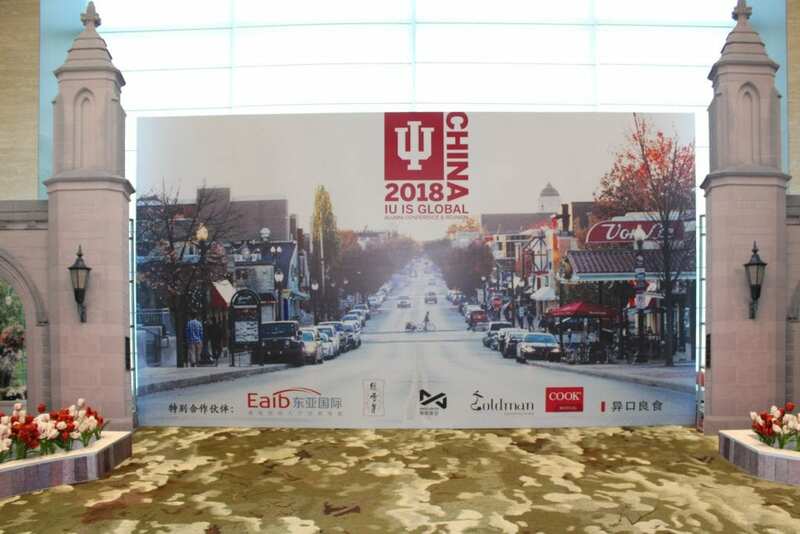 IU’s Chinese alumni brought a slice of Bloomington to Beijing for the IU is Global 2018 Alumni Conference and Reunion. 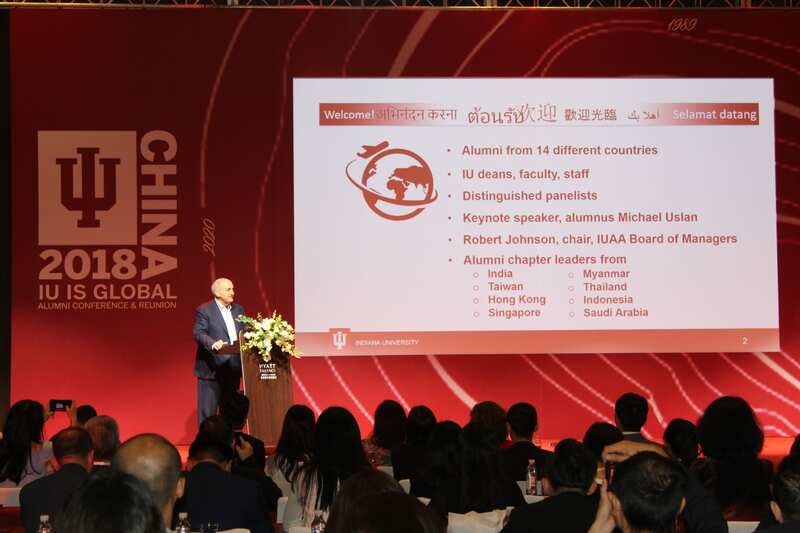 What better time, then, to bring together IU’s international family in Beijing for the IU is Global 2018 Alumni Conference and Reunion, where members of the IU delegation, led by President Michael A. McRobbie and Vice President for International Affairs Hannah Buxbaum, could express thanks to some of IU’s most distinguished international graduates and friends for their continued loyalty and support. Today was also a day when delegation members began reflecting on our productive time here in East Asia, which has truly underscored the extraordinary impact IU has had in this dynamic part of the world and the value of the university’s continuing effort to strengthen its engagement in strategically important countries like Korea and China. This outreach has led to valuable overseas study opportunities for IU students, as well as research collaborations and other exchanges between IU faculty and some of the world’s leading international scholars. It has also ensured a continuing welcoming environment at IU for the best and brightest students from around the world, who diversify and enrich our campuses and the Hoosier communities they serve, bring valuable cultural perspectives to our classrooms and contribute to an educational environment that prepares all of our students – whether they are from Beijing, Bloomington, Korea or Kokomo – for success in the increasingly interconnected and competitive world they will enter when they graduate. 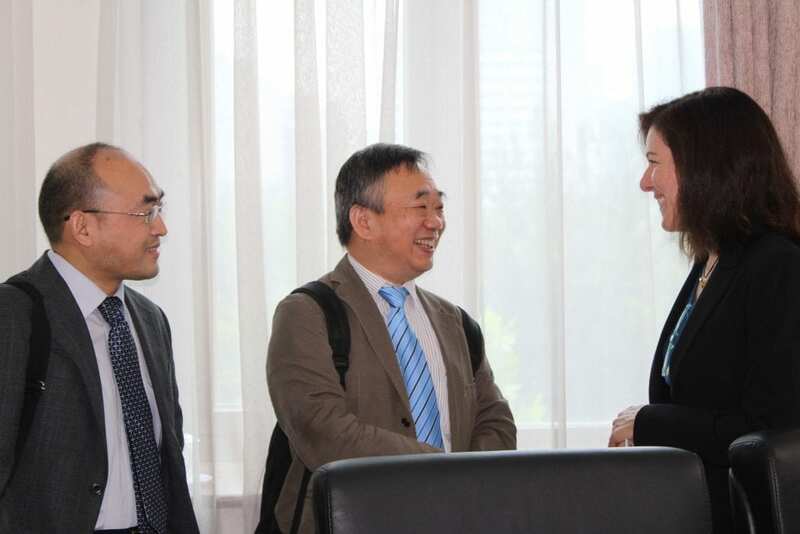 IU Vice President for International Affairs Hannah Buxbaum meets with colleagues from one of IU’s newest global partner institutions, the Chinese Academy for Social Sciences. Connecting with senior leaders and faculty from Yonsei University, one of IU’s longest-running global partnerships, including Yonsei President Young-Hak Kim and Ban Ki-Moon, secretary-general of the United Nations from 2007 to 2016. Expressing appreciation to and pursuing new funding opportunities with representatives of the Academy of Korean Studies, which has helped establish the new Institute for Korean Studies at the School of Global and International Studies and firmly position IU as the Midwestern U.S. leader in the study of contemporary Korea. Renewing and reinvigorating our relationship with Nankai University and honoring the late Binglin He and Ruyu Chen, two of the most distinguished Chinese alumni in IU’s history for their pioneering work in chemistry. Establishing a new global partner in the Chinese Academy of Social Sciences, China’s premier academic organization and comprehensive research center in the fields of philosophy and the social sciences. Celebrating the beginning of a multiyear partnership between the Sidney and Lois Eskenazi Museum of Art at IU and the Tsinghua University Art Museum, the first collaboration of its kind between university art museums in the U.S. and China. Signing a new agreement of friendship and cooperation with Renmin University, one of China’s premier universities for teaching and research in the humanities and social sciences. Engaging in productive talks with senior leaders across business, culture, finance and government and acquiring valuable advice and insights as IU seeks to become an even greater global university. Reconnecting with many alumni and friends in both Korea and China, who contribute to two of the most active international chapters of the IU Alumni Association and continue to serve as IU’s most enthusiastic global ambassadors. Building excitement for the IU Bicentennial Global Alumni Conference and Reunion, a celebration of IU’s graduates across the U.S. and around the world, already being planned for the first week of June 2020 in Indianapolis and Bloomington. If today’s extraordinarily successful alumni conference and reunion in Beijing is any indication, the Bicentennial celebration will be pretty special. Indeed, one would be hard-pressed to design a better warm-up act for 2020. Despite the fact it was the start of the Mid-Autumn Festival as well as a Saturday, more than 300 alumni from across the Asia-Pacific region, representing a remarkable 14 countries, joined President McRobbie, Vice President Buxbaum, senior administrators, IU deans, faculty, staff and other distinguished guests at today’s all-day event. Also in attendance were the IU Alumni Association chapter leaders from Hong Kong, India, Indonesia, Myanmar, Saudi Arabia, Singapore, Taiwan and Thailand. IU President Michael McRobbie provides alumni with an update on recent progress at IU, including advancements in international engagement. Today’s event, IU’s fourth international alumni conference and first since 2015, provided a brief glimpse into the breadth and depth of what has made IU one of the world’s best and most internationally focused universities in the world. The conference began with update from President McRobbie on IU’s record-breaking achievements last year and other recent progress the university has made in strengthening its academic programs, teaching and research infrastructure, and international engagement. Next were a number of interesting and informative alumni panel discussions – moderated by leaders at IU’s School of Global and International Studies (Lee Feinstein, founding dean and former U.S. ambassador to Poland), School of Public and Environmental Affairs (Executive Associate Dean Michael McGuire) and Maurer School of Law (Dean Austen Parrish) – addressing the challenges facing the global economy, the environment and public health, and the changing global legal profession. In his keynote address, IU alumnus Michael Uslan (BA ’73) told the inspiring story of how he capitalized on his IU education to build a career spanning the first-ever college course on comic books to the production of major motion pictures, including the modern-day “Batman” films. 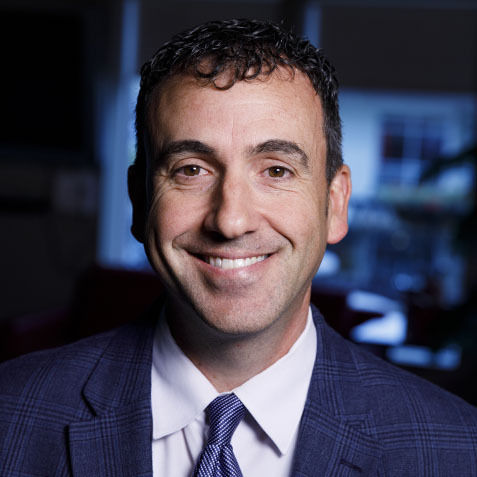 An instructor in IU’s new Media School, Uslan also offered some keen insights on how today’s students can confidently master a rapidly changing world of global business, guided by the spirit of entrepreneurship, innovation and persistence. It was a pleasure to be part of the engaging alumni conference, as well as the evening’s celebratory gala and awards dinner, and in the company of so many amazingly successful and proud graduates, who represented several generations. At the gala and dinner, guests were treated to a wonderful traditional Chinese music performance, which was followed by a series of inspiring welcoming remarks from Robert Johnson, chairman of the IU Alumni Association Board of Managers, a member of the Dean’s Advisory Council for the School of Global and International Studies and a ubiquitous presence at all of Saturday’s activities, Vice President Buxbaum and President McRobbie. Across all ages, the alumni at Saturday’s events talked unabashedly about their continued love for IU, the sense of belonging they felt at IU’s campuses, the personal and professional value of study abroad and their deep gratitude toward the university for providing them with the quintessential university experience. 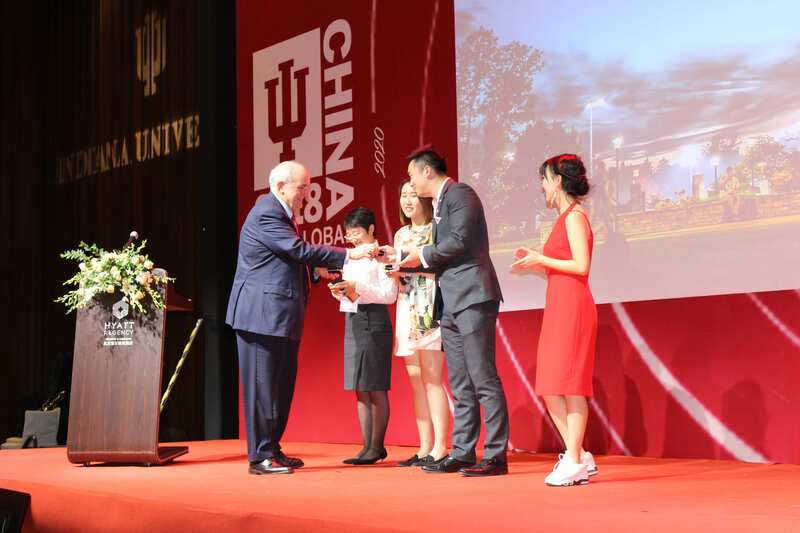 IU President Michael McRobbie recognizes the leaders of the IU Alumni Association Beijing Chapter for organizing the IU is Global 2018 Alumni Conference and Reunion, which drew more than 300 IU international alumni and friends to Beijing. They also expressed excitement over new international developments at IU that will benefit future students, such as IU’s new Global Gateway offices, which are making possible new exchange and research opportunities (read about one such IU project in Beijing that’s addressing major health risks), and the construction of a new International Center. The highly anticipated new facility will provide services and facilities for both the orientation of overseas students coming to IU and students intending to study abroad, allowing them to more closely interact with and learn from each other. As President McRobbie has said on many occasions, IU alumni – no matter where they may live – are among the most dedicated and loyal to their alma mater of any other U.S. college or university, and their successes are truly the university’s successes. Here in China, across the Asia-Pacific region and all across the globe, through their work and service to others, they make major contributions to the prosperity and progress of their communities and their nations. And through their energy, enthusiasm and deep loyalty to the university, they enhance IU’s – and Indiana’s – reputation worldwide. 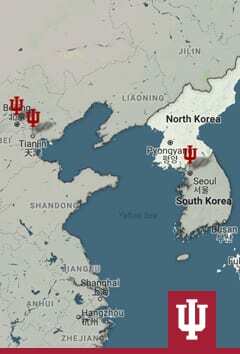 Indeed, if this week’s events demonstrated anything, it is that IU truly is everywhere, that the Hoosier spirit knows no bounds and that the university’s international presence will continue to expand as it continues to increase its engagement here in East Asia and beyond. Goodbye to all of our wonderful friends in China and Korea, and thanks to everyone, wherever you are, for reading!